How could anyone resist a panda onesie craft opportunity? These kits from My Studio Girl are completely ADORABLE. Maybe I should have left this for one of the dotes to make but any character dressed as an animal is going to be hard for me to resist. I have 10 years Tokyo experience. How much would I love an army of these onesie’d cuties? There’s a bumble bee, a duck, a cat, a pig and a rabbit. All you need is to sew through the pre-punched holes and hey presto, instant achievement. Lil D has had a love for watching tutorials on YouTube for a few years now. Teaching herself Irish dancing from repeatedly watching videos was one of the first clues she was hooked. Eating challenges, toy unboxing and crafting tutorials, presented by kids enjoying themselves immensely has given her ideas from Bean Boozled to blindfolded tasting tests. She thinks she’s ready to graduate from watcher to watched. And on the evidence of this weekend we have to agree. Pick your topic. Something you can talk about and explain. (We started with clay modeling, then moved on to a sour taste test then rice krispie treats. It was difficult to stop once we started:-)). Get an assistant. If you want to have fun having someone to share the spotlight creates some unexpectedly fun moments (especially when the assistant is a slightly unpredictable auntie). Talk. No matter what- fill the gaps with information or general chitchat. Better if it relates to the product or game you’re playing, but if need be start plugging your other videos. (Lil D started to reference videos we had yet to make. She’s a real pro). Allow the scene to develop naturally. Structure is good, but sometimes keeping the camera rolling can capture the best bits. (Surprisingly sour sweets + an auntie = camera gold). Know when to stop (Lil D is still working on this. A limited memory card caused some unnatural stops to our videos). Now, all we need is to work out how to upload a large file and negotiate with D’Mummy as to whether this is the career path she imagines for Lil D. If not, the comic timing of Auntie Eims may never be let loose on the world (which is fine by me), but we will have some awesome videos to pull out for blackmail in the future!! Clay charms were right up Lil D’s craftavenue – tiny, detailed work were comparisons between hers and ours can be easily judged. Although the clay started out quite chalky and hard to handle it soon became more malleable so decisions had to be made. Which cute charm should we make? After 20 minutes in a low oven, we glazed them, et voilà ⇑ Cute Clay Charms, just like the box promised. Cruella De Vil / Cruella De Vil / If she doesn’t scare you, no evil thing will. Yeah, yeah, we know, we know. Or do we? Seems we aunties must have made a snap judgement on 101 Dalmations when we were kids cos when we sat down to watch it at Lil D’s request it turned out to be much more than we had imagined. Did you know that there were only 15 puppies? Had us surprised. As did the pipe smoking Roger and the completely unambiguous intent to kill 101 puppies. “Darling!” ” Darling!” “I’m hungry, mother!” Classic stuff. Lil D is our very own Rolly. Gotta say, we really enjoyed it. Lil D told us we were welcome. I love a good interactive notebook. Who said schoolwork couldn’t be fun? Right now I’m compiling resources specifically for struggling readers – kids for whom phonics hasn’t worked. 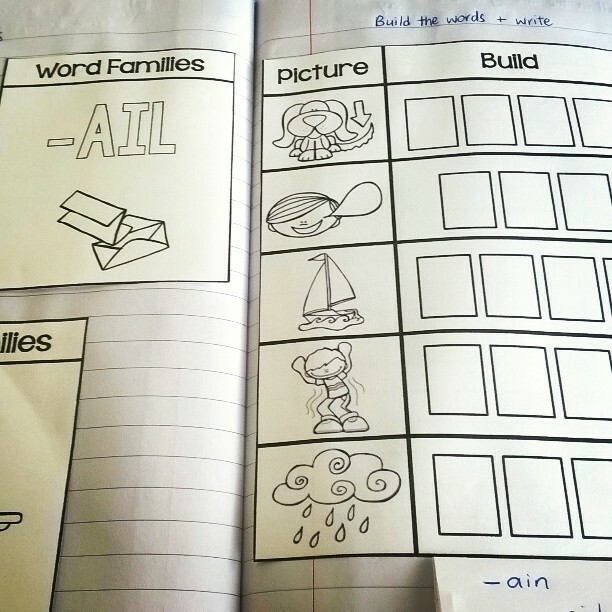 This term’s notebook is working on word families. Highlighting chunks of words that kids can identify as sounding the same and then using that knowledge to read all words with that chunk. Pinterest has a ton of resources. TeachersPayTeachers provides you with premade worksheets for a small fee. From what I’ve seen some are well worth the money. Lil D loves to play with her food and we love to encourage her. At 7 years old she’s had a rich history of cake baking and cupcake showstoppers. Oftentimes the original plan goes out the window with her ever evolving creative input. We start each bake with a photo and an explanation then wait for her to say, “Or we could…” (^-^) We’re learning to let it go and allow her to experiment.